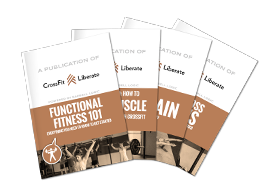 Have a question about CrossFit Liberate? Wow, we must be great mind readers. Hopefully we can answer a few for you in the FAQs below. If not, feel free to contact us and we’ll reply back as soon as we can. We’ve got plenty of option to help you meet your goals and budget. To view our monthly rates, click here. To get started today with a free intro session, just click here. When you first come to CrossFit Liberate, you’ll start out with a free intro session where you come in for a baseline workout, meet us, chat with our coaches, and discuss your goals. Then, you’ll join our Foundations class, where you’ll learn all the basics of CrossFit in a fun, supportive environment before you join our regular classes.